The man on the boat is masked in maroon with a cigarette smoking through a porthole punctured into the fabric. His name is Redi. 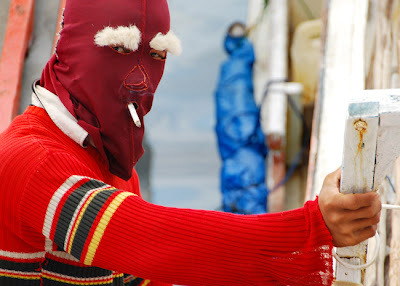 He's a fisherman working the Karimata Strait between Kalimantan and Belitung, Indonesia. “Where did you get it?" “Where did the design come from?" 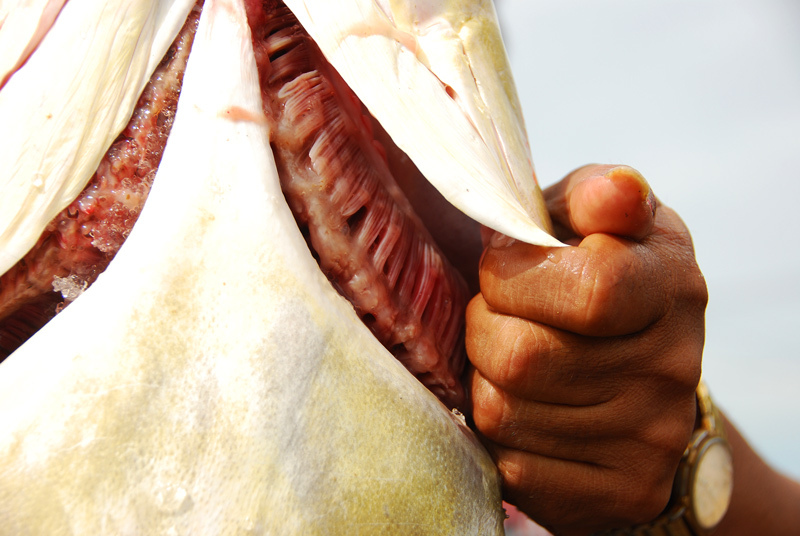 On the north shore of Belitung is the Bugis fishing village of Tanjung Binga. 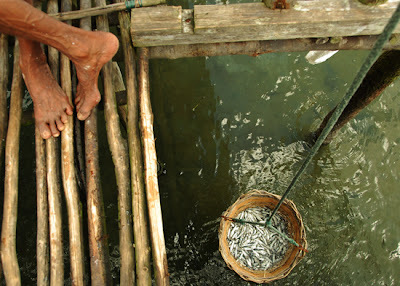 The houses are wooden and sun-paled and perch on stilts. A wooden marina totters on spindly legs into the South China Sea. Fishermen are swiftly unloading their nets onto plastic sheets along the wooden platform, leaving the fish to dry under the sun for two days. “Can I borrow your nose?” asks a fisherman, squinting in the sun. 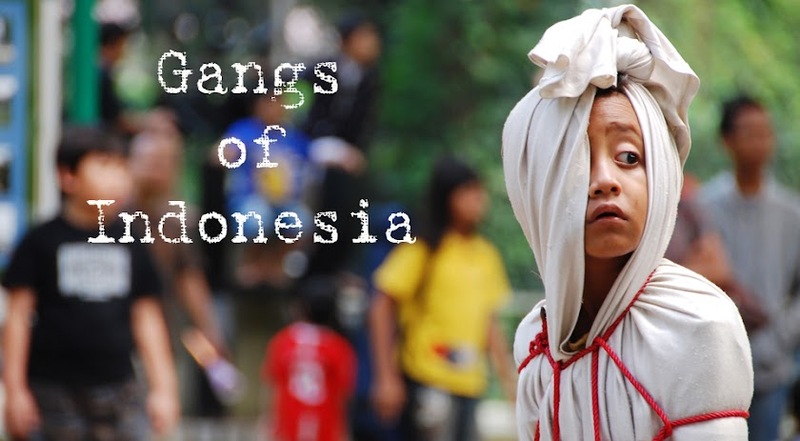 The Bugis people originate from Sulawesi and have a history of sea-faring, trade and exploring. Women wrapped in sarongs chat in the tree shade. “Are you married?" one asks; her name is Susana. A toddler straddles her hip. The man stands up and shyly approaches. I went to Makassar. At the old port there, you have all these small ship-boats transporting everything from logs to Indomie to from the smaller places near and far. I love small ports and harbours over there. Actually there's a good documentary about two English guy's journey on one of those boats from Makassar to Papua in the 70s. Interesting stuff. Can't remember the name now though. 'Can i borrow your nose? '...love this line as it deeply reflects on how Indonesians see the idea of beauty, which pretty much refers to light skin and pointy nose. I've seen pregnant Indonesian women approach foreign men asking them to: "Please put your hand on my belly, so my baby will be a boy with a big nose!" And yet many Caucasians consider the dainty features of Asians to be a beautiful characteristic. It is baffling that i haven't seen pregnant women asking Indonesian with Arab descent. They more likely ask anglo men to rub their belly. I also haven't heard any Indonesians commenting that African women are more beautiful than caucasian women. if any, there will a few. As for caucasians' view on Asian features, to some extent it might be a kind of exoticisation of beauty. Of course, all caucasians are not like that. Media representation of beauty in Indonesia plays important role in constructing this notion of beauty. Many beauty products feature models with white skin and pointy nose. I totally want one of those little boats. And a face mask with big bushy eyebrows.